Artichokes with figs..and a little bit of Paris. Artichokes filled with red fig and topped with a goats cheese can be served whichever way you want to…on the side with a meat dish, or as a salad, or a starter, and even as an amuse bouche with a glass of cold white wine. It is truly delicious and even enjoyed by people who find artichokes without taste. If you want to be really gourmet, you will prepare the atichokes yourself, but you can choose the easier but still delicious way, by buying the frozen artichoke hearts, readily available everywhere. Use frozen artichoke hearts, which is as delicious and fresh and less work. BUT for a special occasion in season , DO put in some effort for some fresh, seasonal artichokes. Feta cheese with ricotta or sour cream can be used instead of goats cheese and crème fraîche. Yellow figs can be used instead of red figs. Substitue maple syrup or thym honey for the white balsamic syrup. Serve as a starter on a bed of greens, or as a side with duck, or as an amuse bouche, served on small plates. Bake at 200 degrees C for about 10 -15 minutes. ..les coeurs d'atichauts au four.. I was in Paris for a quick visit and when passing by Antoine, I couldn’t resist this parapluie for the coming winter and its rains. I never actually use one, because I knock everyone in the eye and over the head or umbrella them off the sidewalk. But I’ve decided everything can be worked at and I want to look chic this winter and for that I need this parapaluie. So I will work at my clumsiness with a parapluie and turn myself into a proper parisienne…just imagine…never again wet hair clinging to my forehead..
I’m almost tempted to say that the elagant Parisienne you see in the following images, is me, but unfortunately my concience won’t allow it! It is my beautiful friend who was willing to play model for me with my ombrelle! And she knows exactly how, since she had been une Parisienne a few years ago, before she became une Tourangelle. ..la parisienne et le parapluie.. Previous Article Chili peppers stuffed with rabbit..and a home library. Those artichoke/fig photos are gorgeous! Sounds like a great combination. I’ll have to try those. 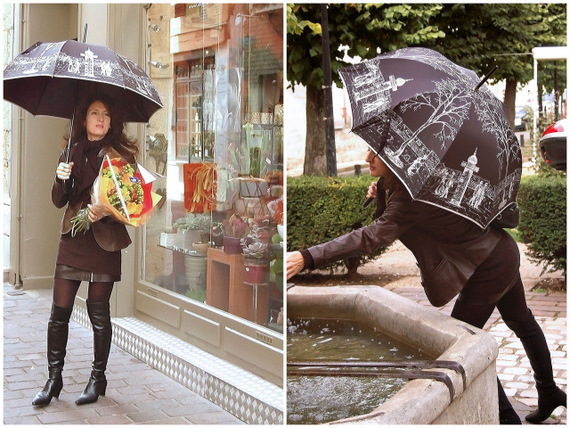 Love your photos of Paris, and what a great umbrella, too. Ahhhh! Such beauty. Great umbrella shots. I love the idea of the artichokes w/ the figs..they look so fresh and pretty.. The umbrella and your adorable model..I can tell you had a nice time..
What sights..and sounds I bet..
C’est toujours si beau avec toi. That is one delightful dish! So original too. 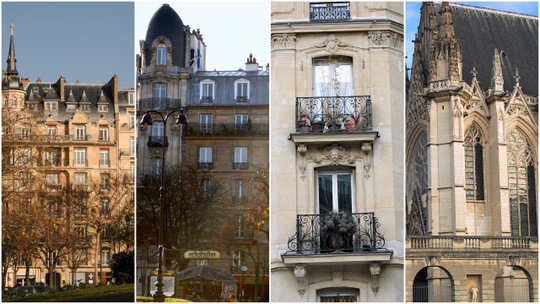 Lovely Parisian shots. You are certainly very elegant and beautiful! Oh, and your friend is beautiful. I did think it was you until I kept reading. I imagine you being all sleek and wonderfully French like that (smile). Hope you have a relaxing weekend, Ronelle. 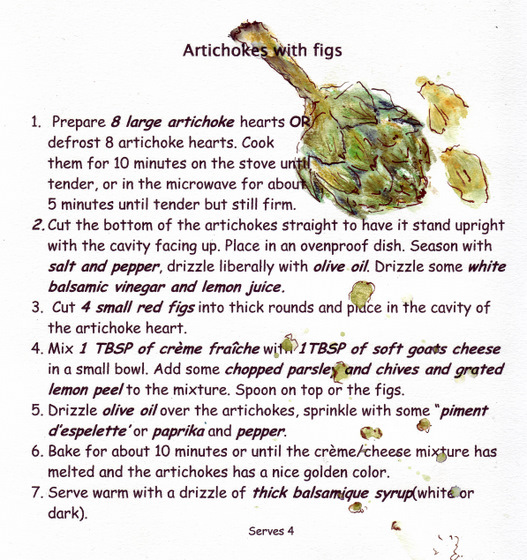 The true artichokes are gone and the figs are quickly disappearing (sigh) but this is stuck in my head – and will be made. 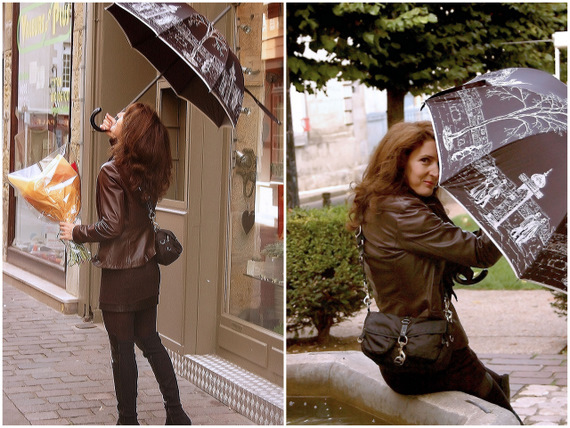 La parapluie is stunning and I wish I had your friend’s sleek Parisian looks…. 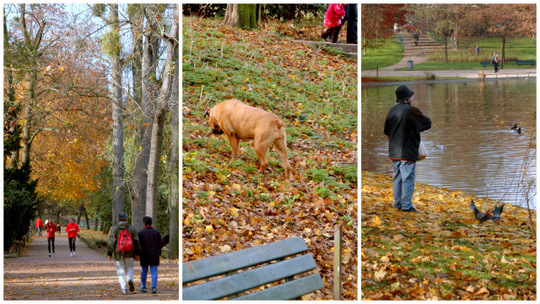 autumn in Paris – why do people always think they must go in the spring? 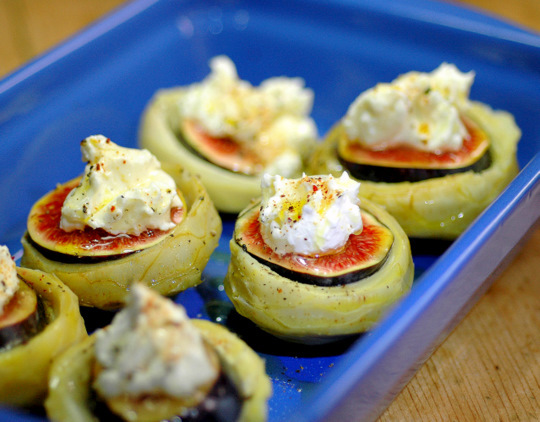 Ronelle, what a combination the artichokes with figs and goats cheese are…it looks delicious! Thanks for the trip through Paris…and you have a beautiful friend, I am sure you had great fun especially with the parapluie…! Great recipe again Ronelle. What a pretty friend and umbrella. How coincidental that we picked the same day to show the buildings of the big cities around us! Paris, what a beautiful place. GorgeOus post Ronelle – I love the umbrella photos! 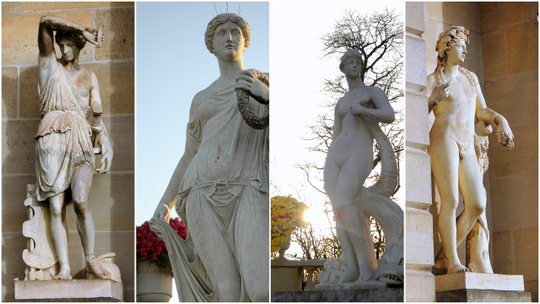 Like you I am enamoured with the Parisian architecture, each time I spend in Paris opens up new treasures to me. My daughter lives in Burgundy so I make the 12,000 mile trip over often. 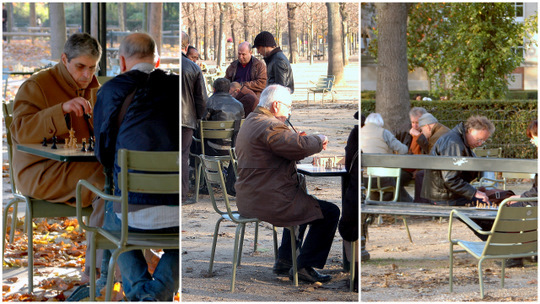 Le jardin du Luxembourg is a favourite place to wander and observe. I’m attracted to and have a passion for the french way of life which is so controlled by the seasons – I love that. There is a definite rhythm that is repeated year in and year out, it’s a constant that can be relied upon in this ever-changing world we live in. Thank you Ronelle for transporting me there today! 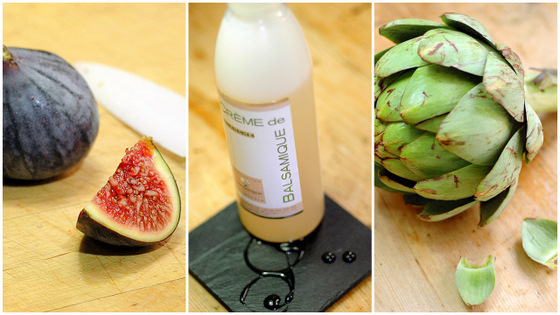 What a beautiful post Ronelle ~I love it all the gorgeous artichoke with figs recipe & those lovely Parisian pics. It’s brought a smile to my face & brightened up my day. Your friend is a delightful lady and the ombrelle looks good on her~ I am wishing I was in Paris right now! These artichokes with the fig and chèvre soufflé on top are a delight. Charming post. The artichokes and figs look delightful! Certainly something I am going to try. And that parapaluie! What a great companion piece that could be with my ginger parasol! I immediately thought that was you until I kept reading. I am sure you are just as fabulous and chic. Thanks for the little trip through Paris. Just got some fresh artichokes at our neighborhood market so this recipe will be the one! love the statue pics and your friend is beautiful..did you get the trolley to match? have fun and thank you for sharing. Wow Ronelle, two of my favorites things together. I would never think of this combination. Loved it. And Paris is just wonderful. LOL… you are camera shy…I so understand you, it took me 2 years for me to actually put a picture of myself in my blog. Your friend btw. looks lovely. 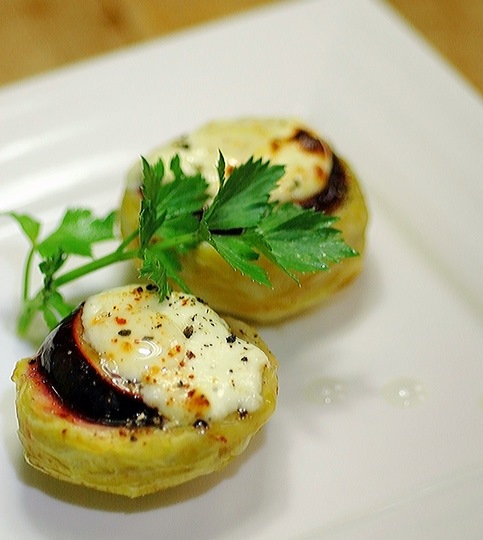 What a gorgeous appetizer with artichokes and figs! And I love the photos of Paris. I’m hoping to go there someday! The shots in Paris are fantastic. How I wish I was there right this very minute. My husband’s family are big artichoke lovers. Moi – not so much and I hardly ever serve them. I thought of emailing the recipe to them and changed my mind. I became inspired to surprise them. I decided that this is a wonderful recipe for me to prepare for them as a appetizer. I know they will be very pleased as well as quite surprised that I thought of it. Well….you thought of it of course, so I’ll be sure to bring along your recipe for them. I know it’s one they will want to duplicate in their own kitchens. Thanks for the lovely inspiration. It was lovely to read this blog, Ronelle. The dish looks lovely, I think I may find tinned ones somewhere….they have a little of the REAL taste. The umbrella pics are good enough to paint, and I loved seeing your typical people and scenes. Beautiful photos! I love the artichoke and fig combination.